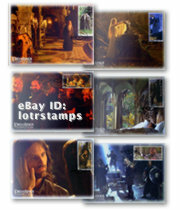 Six limited edition Fellowship of the Ring Maxi Postcards commemorate J.R.R. Tolkien’s Middle Earth with significant dramatis personas and pivotal scenes from Peter Jackson’s award winning ‘The Lord of the Rings: The Fellowship of the Ring’ motion picture. Inspired by ‘The Lord of the Rings’ literary trilogy, they pay tribute to and explore Professor Tolkien’s immortal saga in a manner that film enthusiasts, stamp collectors, and fans will enjoy. 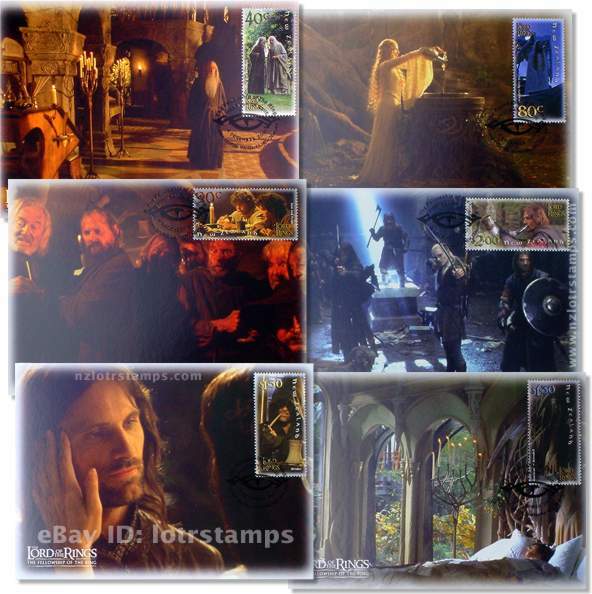 THIS SET INCLUDES all six Fellowship of the Ring Maximum Postcards featuring key characters and scenes from the award winning ‘The Lord of the Rings: The Fellowship of the Ring’ motion picture, with related gummed ‘LotR: FotR’ stamps and first day (04 Dec 2001) cancellation postmark. Now out of print (OOP), these superb Fellowship of the Ring Official Postcards were only issued and marketed in New Zealand to commemorate this almost completely 'Kiwi' year-long cinematic production. Designed by Sacha Lees at WETA Workshop in Miramar, the Maximum Postcard set comes in a clear, archival-quality protective sleeve, and includes a full-colour NZ Post brochure containing extensive background information on both this exciting stamp release and the epic production it honours. Scott Catalog: 1750-1755. See below for more about maxi postcards. WE WILL BE offering occasional ‘The Lord of the Rings: The Fellowship of the Ring’ First Day Cover Miniature Sheets, Stamp Booklet and Presentation Packs while stocks last - either purchase direct or check our regular auctions. As these Fellowship of the Ring maximum postcards were only on sale in New Zealand and sold out faster than anticipated, stock is limited to that on hand. 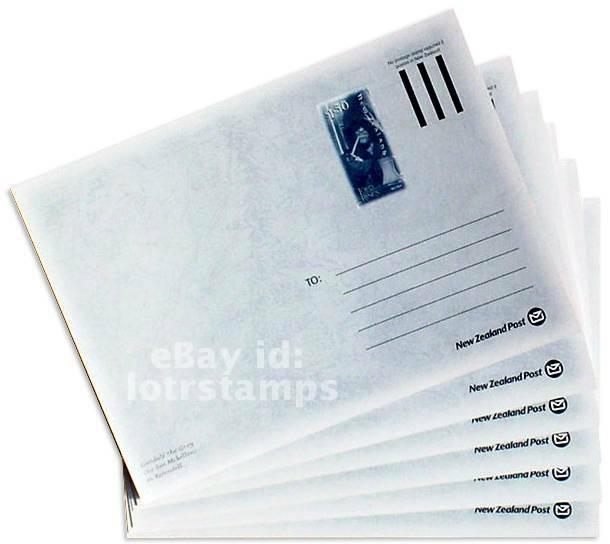 AS A BONUS in addition to the complimentary ‘The Lord of the Rings’ colour leaflet, your Fellowship of the Ring Postcard Set will be posted using additional ‘Lord of The Rings’ gummed stamps on the outer envelope. We also offer FREE* or discounted shipping when you are the winning bidder on several of our auctions. This offer also extends to previous winners - our way of saying "thanks!" 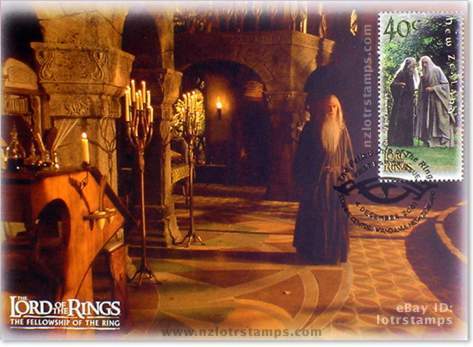 actual size: 105 H x 145 W mm; 4 1/8 x 5 3/4"
Postcard: Gandalf the Grey (Sir Ian McKellen) find solace in Rivendell, Stamp design: Walking in the garden of Isengard, the wizard Gandalf the Grey tells Saruman the White (Christopher Lee) that the long lost One Ring has been found, unaware that Saruman has succumbed to its evil power and also means to obtain it. 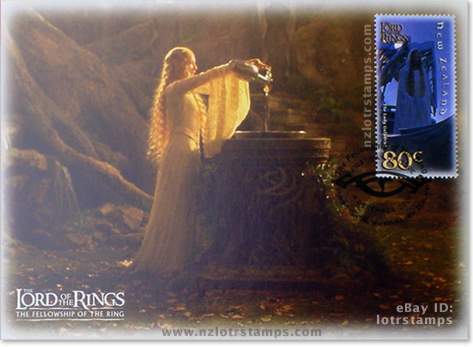 Postcard: Lady Of The Light Galadriel (Cate Blanchett) before the Mirror, Lothlórien, Stamp design: The Lady of the Golden Wood, Galadriel (Cate Blanchett), founded and became Queen of Lorien during the earlier War of the Ring. Offered the One Ring by Frodo, the Queen Of Elves refused knowing too well its ability to corrupt even the most pure of heart. Postcard: Shocked patrons in the Inn of the Prancing Pony, Bree - Frodo (Elijah Woods) has just vanished into thin air, Stamp design: Frodo Baggins - The Ringbearer, accompanied by his good friend Samwise ‘Sam’ Gamgee (Sean Astin) enjoys an ale in the Inn of the Prancing Pony, while nervously awaiting Gandalf, unaware of his imprisonment by Saruman. 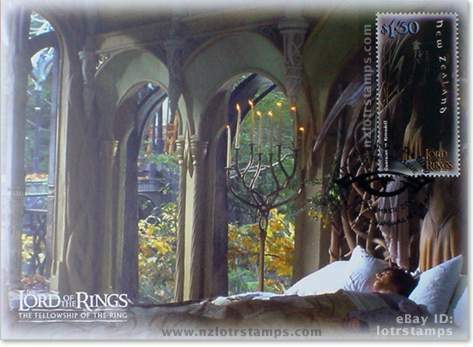 Postcard: After being wounded by a Morgul knife while escaping the pursuing Ringwraiths, Frodo awakens at Rivendell, unaware of having been on the brink of death, Stamp design: The Guardian of Rivendell. 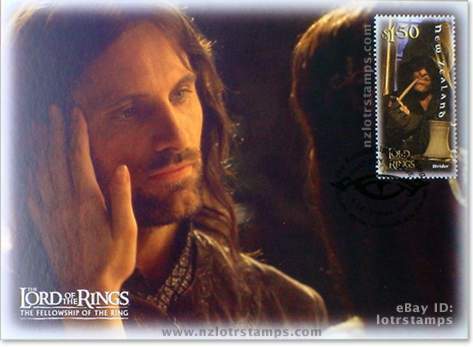 Postcard: A tender moment between Aragorn (Viggo Mortensen) and immortal Elven princess Arwen Undómiel (Liv Tyler) at Rivendell, Stamp design: The mysterious Strider watches Frodo and company from the shadows in the Inn of the Prancing Pony. He’s later revealed to be Aragorn, son of Arathorn, and rightful Heir of Gondor. 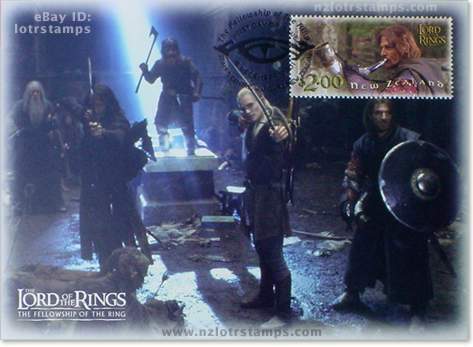 Postcard: Balin’s Tomb - The Fellowship stands its ground in preparation for an overwhelming attack, Stamp design: Boromir (Sean Bean) of Gondor blows the ancient Horn of his people to warn of a savage Uruk-Hai raiding party led by the huge Orc, Lurtz. Boromir gave his life defending Pippin and Merry shortly after Frodo left The Fellowship at Amon Hen. Maximum Cards: Picture postcards which have an illustration relating to the stamp affixed, and a postmark on the picture side of the postcard. The three elements - postcard illustration, stamp and post mark relate but are not identical. Reverse (shown at right) has standard message and address sections, and postage paid imprint over a map of The Fellowship’s progress. 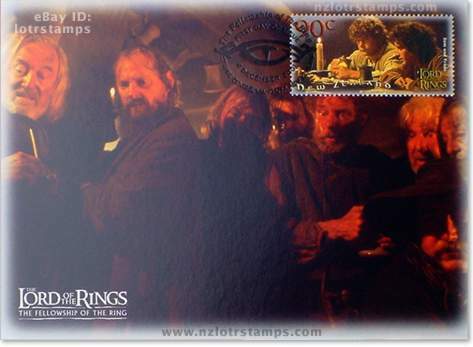 These Fellowship of the Ring postcards and stamps have been postmarked with a specifically-designed cancellation that was only used for that day and issue. The cancellation mark is a stylized Eye of Sauron encircled by the words ‘The Fellowship of the Ring, First Day of Issue, 4 December 2001, Stamps Centre Wanganui New Zealand’. First Day issues are very collectable since they are limited in nature, and hard to obtain after issuance. This issue was only released in New Zealand to commemorate Peter Jackson’s ‘The Fellowship of the Ring’ and sold out significantly quicker than anticipated. Approx. 10,000 Fellowship Maximum Card sets were issued by NZ Post. Additional Info: Maximum Cards are unaddressed. Technical details are available. A later ‘The Two Towers’ set was issued in December 2002 and a third ‘The Return of the King’ set released in November 2003 to commemorate the Middle-earth movie trilogy.